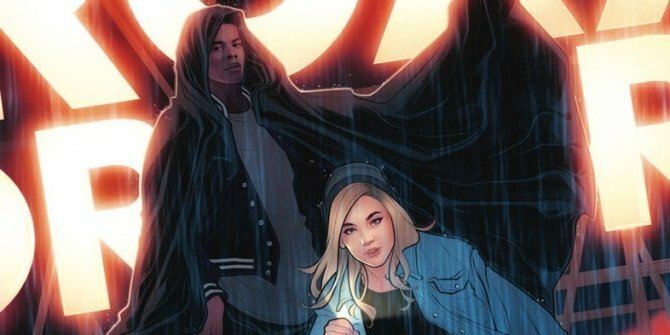 Olivia Holt (Tandy Bowen) and Aubrey Joseph (Tyrone Johnson) become Marvel’s Cloak & Dagger in today’s brand new trailer for the coming-of-age superhero story – which we know will premiere on Freeform on June 7th at 8pm ET. Bursting with young romance and teenage angst, the live-action adaptation comes to us courtesy of showrunner Joe Pokaski (Underground, Heroes), who looks to tell the story of Tandy (Dagger) and Tyrone (Cloak), as they each struggle to understand their superhuman abilities and how to keep them under control. The trailer also teases that the two youngsters are a “divine pairing,” with an ominous voiceover telling us that one will live while the other will die.